Recently, officials with the City of Boston and City Mayor Thomas M. Menino announced that business and homeowners in the area who were affected by Hurricane Sandy can turn to them for assistance. City officials are working to reopen business in the area and to get residents back to work. It’s not actually during the hurricane that is most dangerous, but before and after. Beforehand, you’ve got to prep your house for the worst. After, you have to clean the mess behind. Both come with some serious risks for accidents, injuries and fatalities. Our Boston personal injury lawyers understand that it is critical that homeowners and business owners do what is necessary to reverse the damage caused by water and wind before the winter seasons moves in. You want to make sure that all windows are properly covered. If you’re not planning on staying at the property in question, then you should make sure that all outside items are moved inside and that all electrical equipment is unplugged and moved away from windows. If you’re leaving your business or home, make sure that you have all of the things you need, including important documents, medications, nonperishable food items, extra clothing, cash and even a first-aid kit. Our area got winds between 40 and 50 miles per hour. That was enough to do some serious damage. Wind gusts reached 80 miles per hour. It was so bad that Mayor Menino asked local employers to let their workers stay home. We had coastal flood warnings as well as and high wind warnings for the area. Both of these warnings went through Monday morning. “I urge Boston employers to assist the city in keeping residents safe, and allow employees to work from home,” said Menino. -Office of Business Development: 617-635-0355. 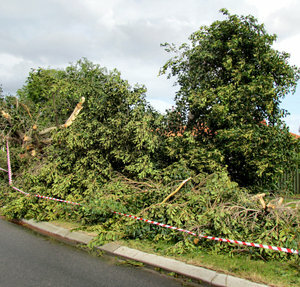 Trees were a big problem in the area. Officials with the Boston Parks and Recreation Department report that there are fallen branches and trees all over! Crews are trying to figure out which areas are most important and are tackling cleanup there. They’re starting with public sidewalks and streets. As of Tuesday morning, there were over 600 reports of tree-related emergencies through the Mayor’s 24 Hour Service. When cleaning up your property, whether your business or your home, be cautious of hanging or downed power lines. This is where the risks for electrocution comes in. Even if you think a line is dead, never go near it. Call the local power company and have them deal with it. So what can you do in the future to stay safe? You can start by registering for emergency notifications with the City of Boston. You’re also urged to call the Mayor’s 24-hour hotline (617-635-4500) with any storm-related issues or concerns. Education and awareness are two of your best keys for safety in these kinds of disasters. If you or someone you love has been injured or killed in an accident, contact Boston Injury Attorney Jeffrey S. Glassman for a free and confidential consultation to discuss your rights. Call 877-617-5333.